In this part we will explore the meaning of the 45th Shloka of Sri Vishnu Sahasranamam. Bhagavan governs all Seasons as He is represents Time (Kaala). He is bestower of grace and a Darshan of his grants His devotee leads to Moksha. He is Time and sets limits on everything. 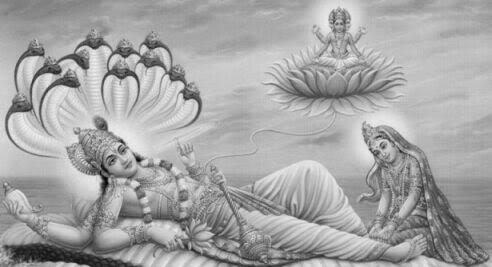 He rests in His Supreme Abode Vaikuntham and absorbs everything within Him. He is formidable and prevails over his enemies. He absorbs all beings within Him. He acts promptly and swiftly to calls of distress from his devotees’. He provides the final resting place to his devotees’ i.e Moksha and He is the most skilled in the world. The Nama is derived from the root ‘Rgati-Praapanayoh’ meaning ‘to go’. Rcchati iti Rtuh – The term Rituh refers to seasons as they push one another and keep coming fresh without interruption. Sri Adi Sankara interprets this Nama as ‘Kaalaatmanaa ritushabdena Lakshyate iti Rituh – Seasons represent time and Bhagavan being the very essence of time is denoted as Rituh’. Sri Parasara Bhattar interprets the Nama as referring to Bhagavan’s auspicious qualities, which are unique and delightful presenting themselves like waves of seasons in the hearts of His devotees and blessing them. Sri Radhakrishna Shastri: Rituh refers to a two-month period, of which there are six in a year. These are called: Vasanta, Greeshma, Varsha, Sharad, Hemantha, and Shisira Rituh. The cycle of time involves these Ritus successively moving one after the other seamlessly. This Nama indicates that Bhagavan is in the form of Time and is behind the cycle of Seasons. Sri Shastri refers us to Aruna Prashnam (9) – Ritur-Ritunaa nudyamaanah vinnaada abhidhaavah – One season prods the other out and declares its arrival loudly. He concludes that this Nama indicates that Bhagavan is in the form of Time, which is behind the cycle of Seasons. Sri Satyadevo Vaasishtha points out that Bhagavan is called Rituh because He is everywhere in all forms of Seasons. ‘Shobhanam Nirvanaphalam darshanam jnaanam asya iti Sudarshanah – One whose auspicious sight or knowledge leads to Liberation or Moksha’. ‘Shubhe darshane Eekshane padmapatraayate asya iti Sudarshanah – One who has beautiful eyes that resemble the petals of Lotus’. ‘Sukhena drishyate bhaktairiti Sudarshanah – He is easily visible to his devotees, hence He is Sudarshanah’. Sri Parasara Bhattar gives the interpretation that this Nama refers to His aspect that the very sight of Him is a source of delight and is auspicious even to those who may be ignorant of His qualities and greatness. Sri V.V. Ramanujan gives the term “Drishti chittaapahaari” (captivating looks) to describe this aspect of Bhagavan. Sri Satyadevo Vaasishtha observes that this Nama refers to Bhagavan’s ability to see and know everything in this Universe clearly and completely without blemish through His ‘Netra’ (Eyes) in the form of the Sun. Also, Him being the Antaryaami (in-dweller) in every form, He sees through everything and everyone. Sri Radhakrishna Shastri relates this Nama to the previous one by interpreting the current Nama as referring to the deity for the Sudarshana Chakra. Just as time is spinning uninterruptedly in the form of the six seasons the six-pronged Sudarshana Chakra is revolving powerfully and without interruption. Bhagavan is the Devata for this Sudarshana Chakram. 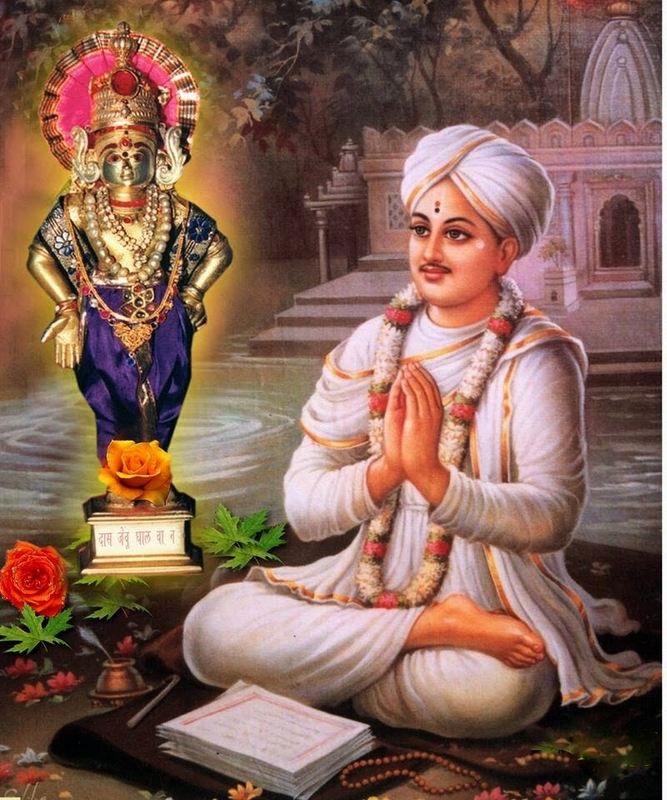 Sant Eknath (1533–1599) was a prominent Marathi Saint, Scholar, a religious Poet and their family deity was Vittala. He learnt the Shastras from his Grandfather Sant Bhanudas until he was 12 years of age. Eknath wanted a Guru’s guidance and so he prayed to Vittala for suggestions. Vitthobha then appeared in his dream and asked him to serve Janardhana Swami as his Guru. One fine day Eknath left for Janardhana Swami’s ashram and prostrated before him and requested to accept him as his Sishya. 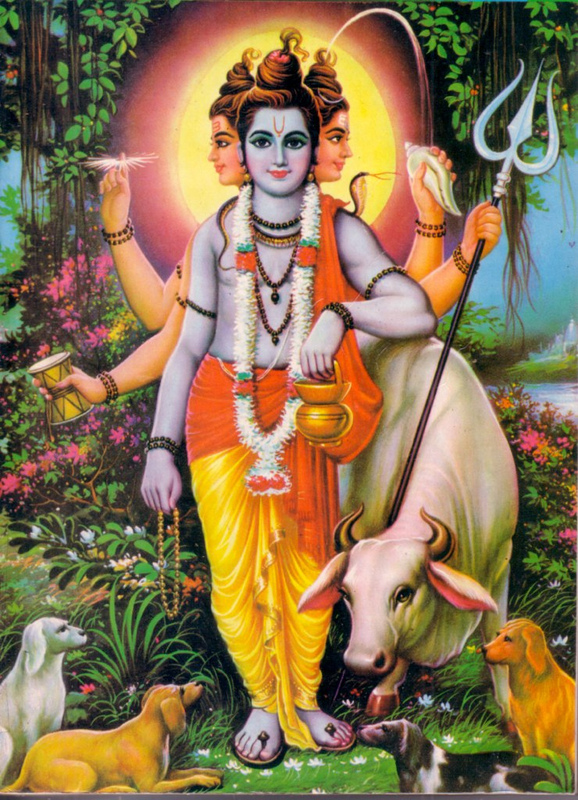 Janradhana Swami was a devotee of Dattatreya an incarnation of the Trimurti. He prayed to Lord Dattatreya to give Darshan to Eknath and Lord Dattatreya obliged to his request. The next day as Eknath went to Godhavari River to have his bath as usual, Lord Dattatreya gave him Darshan in his divine form. Upon seeing him Eknath prostrated to Dattatreya who blessed him. Eknath came back to the Ashram and continued with his daily chores. Janardhana Swami came to check on Eknath and was surprised to see Eknath not showing any signs of elation expected from someone who had realised God. Janardhana Swami was skeptical if God had indeed given him Darshan. He reluctantly asked Eknath if had seen anything strange that morning. Eknath told him that when he was returning from the river he saw his Guru’s deity standing under the tree and he paid obeisance to him. Janardhana Swami was further perplexed by his calmness and said to him that there were so many rishis doing severe penances to realise God and how could Eknath continue with his routine work after seeing the divine God. Eknath replied that his Guru meant everything to him and he was very happy to see this form of the Lord daily. Hearing this, Janardhana Swami was dumbfounded by his devotion. After completing his Gurukula, Eknath settled into a householder’s life. He married Girijabai from Bijapur. He conducted discourses, performed bhajans and kirtans every day. 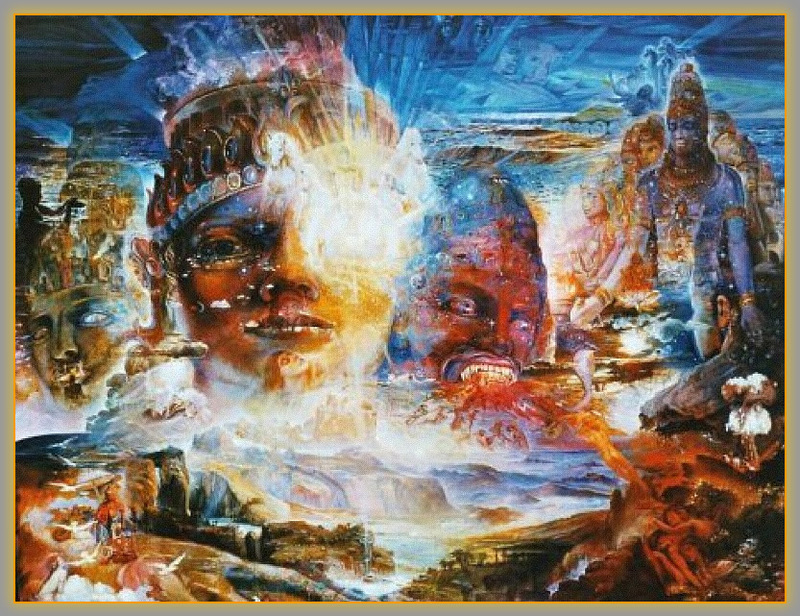 Once when he was writing about Lord Krishna’s conversation with Uddhava in Srimad Bhagavatam, he got into a transcendental state and fell unconscious. His neighbour rushed to his rescue and saw the note about Uddhava in his hand. After reading the literature in Eknath’s note, he realised that Eknath was no ordinary man but a blessed soul. One day as Eknath was reading the Bhagavatam, a 12 year old boy came and prostrated to him asking him to make him his Sishya. Eknath asked him his antecedents and the boy replied that he was Kandiya Krishnan, an orphan from Dwaraka, and that he considered Eknath as his Mother, Father, Guru and God. Eknath told him that no one in this planet is an orphan as all are children of Sri Hari. Eknath took an instant liking to the boy and accepted him as his Sishya. Once, Eknath was performing his ancestral rituals and had invited the Brahmins nearby to take part. Just then, two travellers of lower caste happened to pass by his house and they couldn’t help noticing that a feast was being prepared. Eknath overheard them discussing that it would bring them great joy if only they were offered the sumptuous food. Eknath invited them and offered them the food that was being prepared. The other Brahmins who had assembled for the ceremony felt insulted and left the place. Soon the word spread and all the Brahmins in that village ostracised him. Eknath was disheartened as feeding Brahmins was an integral part of the ritual and no Brahmin would come to his house now. Kandiya Krishnan pointed out to Eknath that if the Brahmins were not available, he could offer the food to the kurcham (darbha grass). Eknath started performing the rituals and when he placed the 1st Kurcham, Lord Vittala came and sat down to have the food followed by the other gods, the Pancha bhootas and his forefathers. Kandiya Krishnan was watching and smiling to Eknath’s bewilderment. After having the food, they blessed Eknath by reciting the holy mantras and disappeared. It was almost a year since the Brahmins had ostracised him. Eknath went to the Brahma Samaj and said that he was ready to make amends (perform pariharam) to atone his irreverence. The Brahmins got together and started preparing a list of things to be done as per their whims with the main intention of grabbing his wealth. As Eknath began to fulfil the list of pariharams, the Brahmins were grinning with the hope of enriching themselves at his expense. Eknath began with the ritual getting ready to do his pariharam. It was almost noon when a leper came enquiring about Eknath. He said that he had come from Triambakeshwar and wanted to do Pariharam. The Brahmins told him that they were the ones doing pariharam for Eknath and suggested that they were the learned Brahmins and he should consult them. The leper informed them that none other than Eknath can perform the prayachittam for him. The leper said that he had been to Triambakeshwar and prayed to Lord Shiva to cure his leprosy and Lord Shiva had come in his dream who advised him to take the Paada Theertham of Eknath as that was the only cure for him. As soon as he said this, Krishnan led the leper to Eknath. The leper prostrated before Eknath and requested him to accept Pada Pooja from him. Eknath refused out of humility but the leper told him that it was Lord Triambakeshwarar who had instructed him to do this. Eknath relented when he heard that it was the wish of Lord Shiva. The leper performed the paadha pooja to Eknath and as he drank this water his body healed instantly. The Brahmins were astonished to see this miracle. The Brahmins bowed their head in remorse and slipped away. There was once a devout Brahmin who set out on a Yatra to visit all the holy places and wherever he went the deity of that temple would speak to him because of his intense Bhakti. One day when he went to Dwaraka, the Lord did not give him Darshan nor did the deity speak to him. He began to doubt if his Bhakti was deteriorating and hence god wasn’t revealing Himself. He decided to fast until he got a reply from the Lord. After 12 days of fasting, Lord Krishna appeared in his dream and said that He was in Prathistanapuram (now Paithan) with Eknath for the past 12 years. He told him that he can have his Darshan if he goes to that town. The next morning the Brahmin woke up early and left for Prathistanapuram. He reached Eknath’s house to meet him. Eknath was engrossed in Srimad Bhagavatam. The Brahmin prostrated to him and asked him the whereabouts of Krishna. Eknath assumed the Brahmin to be a relative of Kandiya Krishnan and told him that he had gone to the river Godavari to fetch water and would be back soon. He also asked him to be seated till Krishnan was back. Krishnan then returned from Godavari with water pots but did not greet the Brahmin. Eknath was surprised that both of them did not greet each other. He then asked the Brahmin if he saw Krishnan going inside the house. The Brahmin then told him that he was looking for Lord Krishna and explained him the incident in Dwaraka. On hearing this, Eknath ran in to the house searching for Kandiya Krishnan but only the pots in which he fetched water were there and Krishnan had disappeared. Eknath started wailing and cursed himself for not being able to recognise God and for allowing Him to do the chores for him. Eknath went into a meditative state thinking only about God. One fine day a few Brahmins approached him to join them on a Theertha Yatra. They went to places like Kasi, Prayag, Vrindavan, Ayodhya, Mathura etc. Eknath joined them in the hope of getting a glimpse of the divine Vittala. He performed Bhajans and pravachans wherever he went. As he was returning home after completing the Yatra with his group, they had to camp in a place. There was scarcity of water in that town. They came upon a donkey lying down almost in an unconscious state due to thirst and heat. Seeing the donkey in such a perilous state, Eknath moved forward and give his Ganga theertham to the donkey. The others who were with him said that he should not treat the holy water with disrespect. Eknath said that there was no greater deed than saving a life. Seeing this, the others left him and moved ahead as they did not approve of his action. Slowly the pale donkey transformed into the great Lord Vittala. Eknath was delighted and prostrated to the Lord who blessed Eknath for seeing Him in every being. One day a group of people were gambling. A small quarrel ensued amongst them and one person from the group commented that he was not Eknath to be calm and not to get angry for anything. One of the listeners asked if Eknath really would not get angry for anything. All the others agreed in chorus. He then said that if someone doesn’t get angry then he is not human and challenged that he would forfeit all his money if he failed to annoy Eknath. The next morning he was waiting for Eknath to return from the River Godavari after his bath. The gambler was chewing paan and spat on Eknath’s head from the terrace of his house. Eknath did not even bother to look up to see his perpetrator, nor did he express any displeasure. Instead, he went back to the river to bathe again. The man repeatedly taunted Eknath by spitting Paan every time he returned from his bath. By noon the gambler had consumed his entire paan and was also tired of the routine. Finally, the gambler confronted him and asked him how he was so patient while he was spitting on him since morning. Eknath replied to him that he came to Godavari to clean his body before performing his pooja. By spitting paan on him, he only dirtied his physical body and he went back to clean it but had he got angry and shouted at him, his mind too would have become defiled and it would been much more difficult to clean his mind than cleaning his body. The gambler was moved hearing these words, comma prostrated to him and begged for forgiveness. There are many more such incidents which glorified Eknath. 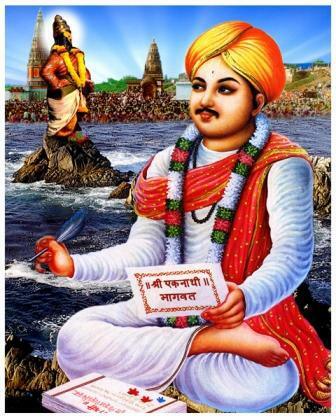 He was seen as a bridge between his predecessors—Sant Dhyaneshwar and Sant Namdev. Eknath initiated a Bhakti movement in Maharashtra called as ‘Vasudeva Sanstha’. Eknath was one of the earliest reformers of untouchability in Maharashtra. He spent his entire life spreading the gospel of Lord Krishna among the masses in Marathi. His most prominent work is the Eknath Bhagavat, where he penned the dialogues between Lord Krishna and Uddhava. He who measures everyone’s Karma and doles out the phala. Kaalaaya Namah – The Nama is derived from the root ‘Kala Samkhyaane’ to measure or count. Sri Sankara interprets this as ‘Kalayati sarvam iti Kaalah – He measures, counts or limits everything’. In other words, everything other than Bhagavan has only a limited or measured span of existence. ‘Kaalosmi lokakshayakrit Pravriddho – In the form of Time I control the eventual destruction of the world’. Sri Parasara Bhattar interprets this Nama as Charaachara Sankalanaat Kaalah – He who gathers everything – movable and non-movable, into Himself through His delightful qualities (Kalanaat Kaalah). Sri Ramanuja’s commentary that relates to this Nama is from the Bhagavad Gita – ‘Anartha-prepsutayaa ganayataam madhye kaalah mrityuh aham – Of those who reckon with the desire to cause misfortunes or calamities, I am the God of death’. Sri Nrisimha Raghavacharya Swami has commented that this Nama refers to the One who is proficient in keeping record of actions for everyone during their lifetime viz. Chitragupta. Swami ChinmayAnanda says that this Nama can also mean that He is the Death or annihilation to all His enemies. He adds further that this Nama signifies that Bhagavan measures the merits and demerits of each individual’s actions and metes out the appropriate results – Kalayati iti Kaalah. Sri Satyadevo Vaasishtha has also given this same interpretation – Sarveshvaro Vishnureva kaalo, yato hi sa kalayati ganayati samasta-praani-karmaani, tadanukoola phala-pradaaya. Kaalo hinama Bhagavan Svayambhuh anaadi madhya nidhanah – Bhagavan is Time himself with no beginning, middle or end. Samkalayati kaalayati vaa bhootaani iti kaalah (Sushruta Sootra 6. 3). He who resides in the Supreme cave of the heart. Sri Adi Sankara interprets this as ‘Parame prakrishte sve mahimni Hridayaakaashe sthaatum sheelam asya iti Parameshthee – He resides in the prime of the heart in all His glory hence He is called Parameshthee’. Vedic mantra says ‘Parameshthee Vibhraajate’ – the Supreme God is radiant and resides in the middle of the Lotus-shaped heart’. Sri Parasara Bhattar gives the interpretation as – Parame sthaane tishthati iti Parameshthee – He who resides in the Supreme Abode, Sri Vaikuntham. After completing His sport of hunting the Rakshasas, Bhagavan goes back to His Supreme Abode, so He is known as Parameshthee. Meaning: To rid the burden of the world, He waged a mighty war, routing and killing enemies and showed His wonderful-form. He then left and entered his own dear resort in the sky. Through worshipping his feet alone, I have found a peerless master. Tasyaah Shikhaayaa madhye Paramaatmaa Vyavasthitah – In the Middle of that Flame, the Supreme Self dwells. Swami ChinmayAnanda, while following Sankara’s interpretation, bases his explanation on the Kathopanishad “Parame vyomni prathisthitah” – He who is centered in the Supreme cave of the heart and can be experienced. He who has everything in this Universe under His control. Sri Adi Sankara gives three different interpretations for this Nama. The first meaning is ‘Sharanaarthibhih Parito Grihyate Sarvagatatvaat – He is grasped on all sides by those who seek refuge in Him’. The second meaning offered by him is ‘Parito jnaayate – He is realised by seeking him from all approaches’. The third meaning is ‘Patrapushpaadikam Bhaktaih Arpitam Parigrihnaati iti Parigrahah – He is Parigrahah because he accepts any offering like flowers and leaves made by his devotees’. Meaning: If one offers Me with love and devotion a leaf, a flower, fruit a water, I affectionately accept that devotional offering from that pure hearted being. Sri Parasara Bhattar gives the interpretation – ‘Atra tatra cha parito grahah asya iti parigrahah – Here, there, and everywhere, He accepts all’. Quite appropriately, this is the last of the Namas that Sri Bhattar interprets as referring to the Sri Rama incarnation. When Lord Rama departed to Sri Vaikuntham after the purpose for his incarnation was completed, He took every resident of Ayodhya with Him, including the gardens, trees, etc. Sri Satyadevo Vaasishtha gives the interpretation that Bhagavan is Parigrahah – Paritah Sarvatah Grahanam – He who has everything in this Universe under His control through His power. Karpaar Rama piraanai allaal matrum karparo? Narpaaluk kuittanan naan muganaar petra naattule. Meaning: In the blessed Ayodhya, the land created by Brahma, down to the meanest gross and insect without exception, He gives an exalted place to all the sentient and the insentient, so would any scholar study about a King other than Rama? Sri Adi Sankara interprets this Nama as ‘Sooryaadeenaamapi Bhayahetutvaat Ugrah – He causes terror to even the mighty, such as the Sun, hence He is called Ugrah’, Shankara quotes a Vedic mantra ‘Bheeshodeti Sooryah – Even the Sun rises out of fear for Him’. Sri Parasara Bhattar explains that the next few Namas are in the context of Bhagavan’s Kalki Avatar. The Nama is derived from ‘Uc – Samavaaye – to collect together’. At the end of Kali Yuga, with the decline in righteousness (Dharma) and a predominance of unrighteousness (Adharma), Bhagavan will become Ugra- furious and wrathful, and take the Kalki Avatar to annihilate the miscreants and establish Dharma. Meaning: Whenever and wherever there is a decline in Dharma, O descendant of Bharata, and a predominant rise of Adharma -at that time I descend Myself. In order to deliver the pious and to annihilate the miscreants, as well as to re-establish the principles of Dharma, I advent Myself millennium after millennium. Sri Adi Sankara interprets this as ‘Samvasanti Bhootaani Asmin iti Samvatsarah – All beings reside in Him, hence He is called Samvatsarah’. Meaning: Understand that as the mighty wind is blowing everywhere and is always situated within Space; similarly all created beings rest in Me’. 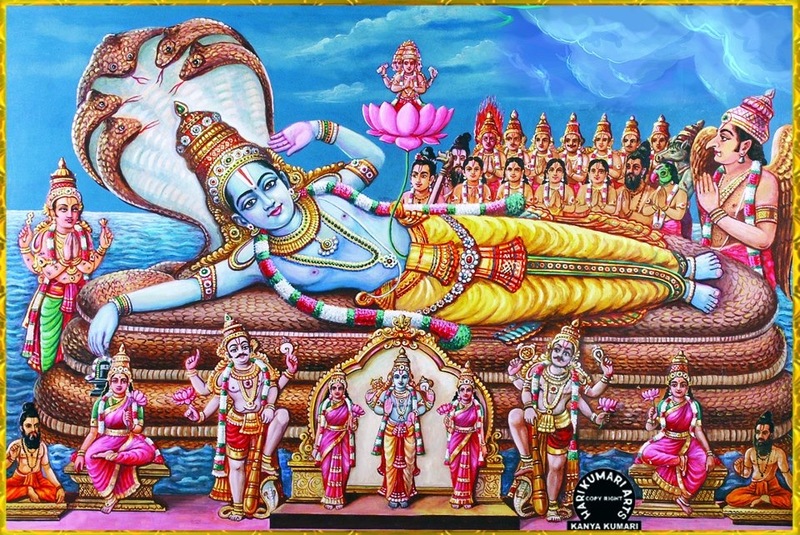 Sri Parasara Bhattar’s commentary is that Bhagavan is reclining on the Ananta-couch (Serpent bed or Ananta Sayanam) in the Paataala loka (nether world) with all His weapons awaiting the time when He has to appear as the Kalki Avatar. Sri ChinmayAnanda gives the meaning “Year” to the word Samvatsarah, and interprets this to mean Time, in the context of which all beings exist and acquire their experiences. Sri Adi Sankara gives 2 interpretations for this Nama. The first is ‘Jagadroopena Vardhamaanatvaat Dakshah – He keeps growing with the world, hence He is Dakshah’. The second is ‘Sarvakarmaani kshipram karoti iti vaa Dakshah – He accomplishes all his deeds with incredible speed, hence He is Dakshah’. The Nama Dakshah also means an expert, who has three qualities of Immensity, Strength, and Quick Execution – ‘Pravriddhah, Shaktah, Sheeghrakaaree cha Dakshah’. This Nama conveys that all these qualities are natural to the Supreme Being. Sri Parasara Bhattar continues his interpretation in terms of the Kalki Avatar and points out that this Nama refers to Bhagavan’s swift action and expertise in eliminating the Dasyus (miscreants, looters) during His incarnation. Sri ChinmayAnanda gives the explanation “He who is Smart”, because He is very prompt, efficient and diligent in His function of Creation, Protection, and Destruction of the whole Cosmos. He also explains that this Nama refers to Bhagavan’s readiness to reach and help all, at all times, everywhere, under all circumstances”. Meaning: The well-armed Lord is ever-ready and has it all arranged, to destroy the Asuras by the score. The bull-rider Siva, the four-faced Brahma and the Lotus-dweller MahaLakshmi reign on his peerless frame. On sighting the captivating Lord, my looks have no bearing. This Nama also occurs later as Nama 917, where Sri Parasara Bhattar interprets the word in terms of Bhagavan’s instantaneous response in coming to the rescue of Gajendra. Sri V.V. Ramanujan observes that Sri Parasara Bhattar’s anubhavam of this incident is that Bhagavan acted with alacrity when He came to the aid of Gajendra instantaneously that He did not have time to inform Lakshmi Piratti. One who provides rest to all beings. The Nama Vishraamah is derived from the word ‘Srama or effort’, hence Vishraamah means rest. He is the place of rest for those who are extremely worn-out by the heavy burden of their sins and the experience of their fruits. Sri Adi Sankara gives a detailed interpretation for this Nama ‘Samsaara Saagare Kshutpipaasaadi Shadoormibhih Tarangite Avidyaadyair Mahaakleshaih Madaadibhih Upakleshaih cha Vasheekritaanaam Vishraantim Kaankshamaanaanaam Vishraamam Moksham Karoti iti Vishraamah – He who gives liberation or releases from the major waves like hunger and thirst in the Ocean of Samsara, great miseries like ignorance, minor miseries like intoxication to those suffering from these and who want to be released from such afflictions’. The idea is we all suffer from physical problems, mental problems, bad habits and ignorance and we all want to be emancipated from such miseries. Bhagavan is the only one who can give us relief from such suffering and give us respite from such constraints. Sri Satyadevo Vaasishtha gives the derivation – Vishraamyati yasmin sarvam iti Vishraamah. – Bhagavan is also the place of rest for all the jeeva-s at the time of pralaya. Sri Radhakrishna Shastri observes that Bhagavan created night after a day’s toil for the beings to rest, death after a life of Karmas, warm fire for those who shiver from cold, shade to rest for those scorched by the Sun’s rays, etc. and thus He constantly provides the comfort of rest for every affliction. When those who suffer the effects of their Karma think of Him, He makes this thought itself the shield for them from their sufferings, and provides the much needed relief. Sri Adi Sankara gives 2 explanations. The first one is ‘Vishvasmaat dakshinah shaktah – He is more skilled than the whole world’. The second is ‘Vishveshu Karmasu Daakshinyaat vaa – He is most skilled in all tasks in the world’. 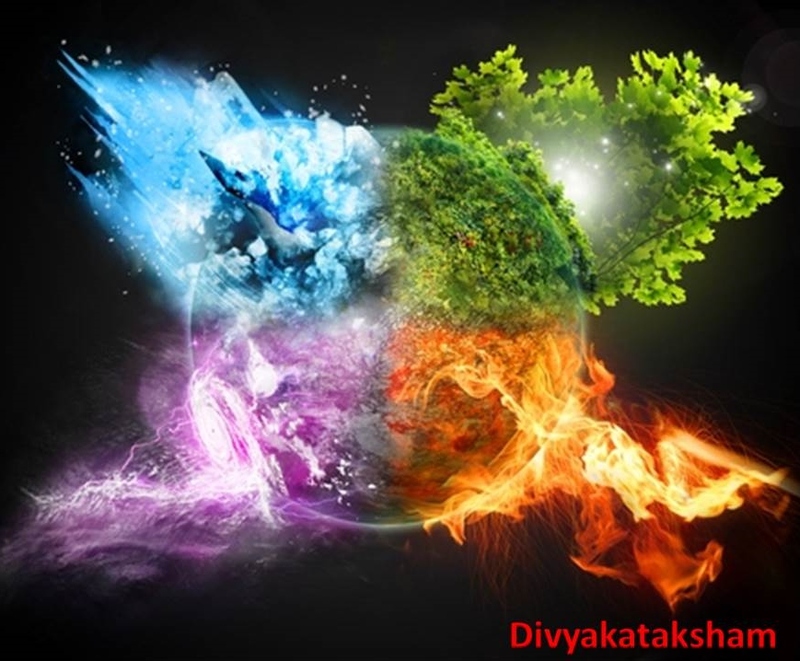 Vishvasmin ishta-anishta kaarini aviseshena dakshate iti vishva-dakshinah – He shows His favor uniformly to all. This was the case in the Trivikrama Avatar, where He blessed everyone with His Feet in addition to MahaBali. Vishvam dakshinaa asya iti vishva-dakshiNah- He gives away the world as Dakshina or fees to the performing priests. 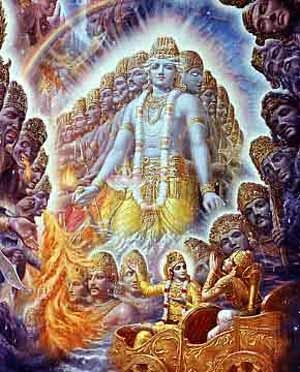 In the Vanaparva in MahaBharata, we have “Then He will destroy all the robbers and will offer this Earth as Dakshinaa in the Ashvamedha Yagna to the officiating priests”. The word Daakshinya (derived from the same root as Dakshinah) refers to His Guna (quality) of forgiving enemies. Swami ChinmayAnanda elaborates that all the efficiency and skill in the Universe among the living dynamic creatures is but an expression of Him, since He is the source of the skill and efficiency. Bhagavan is Time and governs all Seasons, hence He is Rituh. He is bestower of grace and a Darshan of his grants His devotee leads to Moksha, so He is Sudharshanah. He is Time and sets limit to everything and hence He is known as Kaalah. He rests in His Supreme Abode Vaikuntham, so He is Parameshthee and as He absorbs everything within Him, He is Parigrahah. He is formidable and prevails over his enemies, hence He is ‘Ugrah’. He absorbs all beings within in Him as Samvatsarah. He acts promptly and swiftly to calls of distress from his devotees, so He is Dakshah. He provides the final resting place to his devotees’ i.e Moksha, so He is called Vishraamah and He is the most skilled in the world and hence He is Vishvadakshinah. 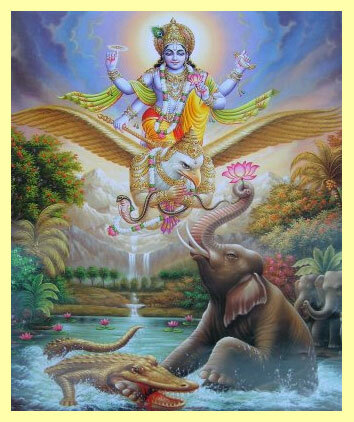 This Vishnu Sahasranamam series is authored with the help of my friend Shri Balaji. I Realised and happy to know about my nakshatra sloka and had immensed with the fruitful stories and finally reaching to moksha. May Lord Narayana bless you and your family! Thank you Rajini ji! God bless you! Hari Om! Su means good, great or other superlative qualities and Darshan is sighting…hence sighting him is auspicious or divine. Sri Parasara Bhattar gives the interpretation cited by you. Om Sudarshanaya Namaha! The most powerful one! Great narration sir, at this rate, you will soon be called as Sridhar Aazhwar. I have very little knowledge which I gained through my Paati, which I share on your site. I am not as knowledgeable as you are, so please feel free to point out my errors. Thank you Aishvarya 🙂 You are being modest! You are doing quite well and now by quoting Divya Prabhandam, you are showing a new facet!!! I am glad that the blog is making people understand our scriptures a bit more. Excellent narration as usual sir. My sincere heartfelt wishes to you and your family for the great shares. Very overwhelmed at times. Thank you. Hari Om! Thank you Shobana 🙂 God bless you! Hari Om! Good evening nice to see your post earlier this week. Hari Om Sir, god bless! Thank you Tanisha 🙂 Indeed. I am trying to release it during weekends so that people have the time to read it! Thank you 🙂 Hari Om! Greetings to you! Sincerely appreciate your efforts. Thank you Sowjanya 🙂 God bless you! Hari Om! Uncle Eknath story is beautiful. More than Vishnu Vittala is easier to please. He easily comes to all devotees. Is it not? Meaning: I surrender to Lord Sudarshana who is ever smiling, who is adorned with necklace, a bracelet,and a crown and whose body is adorned with all exquisite ornaments. Meaning: I surrender to Lord Sudarshana who eliminates the enemies and all diseases of those who worship him with an image and recite this mantra. Meaning: I surrender to Lord Sudarshana who kills off the demons with just the tinkling of his diamond anklets, wonderful person with overflowing beautiful hair and prettiest eyes. Meaning: I surrender to Lord Sudarshana who has a majestic bellow like Bhairava, who is mighty and who destroys all impediments to his devotees and puts down all evil doers. Meaning: I surrender to Lord Sudarshana who is deep beyond comprehension but can be captured by our mantras and who is auspicious and has a sweet face. 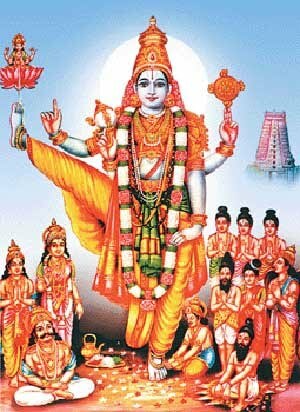 Meaning: I surrender to Lord Sudarshana who will be propitiated by these 8 stanzas. May he protect us all of us at all times. There are a few spelling mistakes in the version given by you; I will post a corrected version soon. May you be the full recipient of Lord Sudarshana’s blessings. Thank you very much for the beautiful translation Uncle. I searched for it on google but could not find it. I thank you humbly for your kind blessings. Hari Om Uncle! I thank you for the correct spelling of the shloka too. I shall save this version. Thank you Uncle! Hari Om! Hari OM Balaji Uncle! Yes I understand I take print out sometimes to school to learn the correct way to pronounce. Sometimes I find it difficult to remember. But I never forget the stories. Thank you Uncle! Excellent Shambavi!!! You continue to amaze with your interest and knowledge of Shlokas! God bless you, Hari Om! Also please note that the Mantras given here are for information only. To get the best results please approach a Guru and get the initiation from him / her face to face with due respect and regard. Thank you so much Uncle. I feel rewarded when I get shloka for a shloka. Very kind of you to reply to my comment. I told my teacher about this blog she was very happy and I even shared some of the stories I read here in my shloka period, and my teacher Jayalakshmi Maam’ made everyone clap for me. I thank you and Balaji Uncle a lot. Hari OM Uncle!